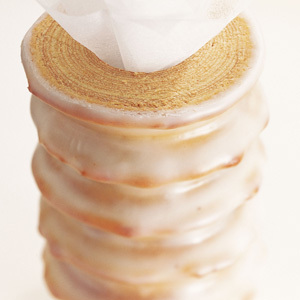 Baumkuchen is 'correctly' baked by pouring or brushing layers of batter onto a rotating spit in a large oven made specifically for the task. This recipe shows how you can bake the classic cake in a standard household oven. Preheat the oven to 440°F/225°C. Beat the butter with ¾ cup of the powdered sugar until thick and fluffy. Add the egg yolks one by one. Mix in the lemon zest and alcohol. Add the flour and cornstarch, and stir. Beat the egg whites with the salt and remaining powdered sugar until stiff. Stir about 1/3 of the egg whites into the yolk mixture, then stir in the flour mixture. Fold in the remaining egg whites. Divide the batter in two, and spread flat onto two greased baking sheets. Bake in preheated oven at 437°F/225°C for about 8 minutes. Flip the sheets of cooked cake onto a flat surface to cool. When cool, cut each sheet from the lengthwise into four strips. Spread a thin layer of apricot jam on seven of the eight cake strips. Set the strips on top of one another, placing the plain strip on top. Cover with parchment paper. Place a heavy wooden board on top let stand several hours. Cut the edges of the cake clean and sharp and brush the edges with the remaining apricot jam. Dissolve the chopped chocolate with the refined coconut oil a double boiler over hot water. Allow cool slightly and spread on top and sides of cake.